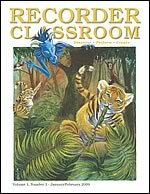 Click to hear excerpts from Recorder Classroom magazine. Pick an issue and listen. Our toll-free Customer Service number: 1-800-437-0832. Commercial: 1-262-790-5210. Copyright © 2007-2019 Plank Road Publishing. All rights reserved.